The voice cast and producers of Disney XD's highly-anticipated DuckTales animated series descended upon the D23 Expo yesterday, showcasing a new sneak peek from the show, which you can check out below. Francisco Angones (co-producer and story editor) and Matt Youngberg (executive producer) were joined by voice cast members Beck Bennett (Launchpad McQuack), Kate Micucci (Webby Vanderquack), Toks Olagundoye (Mrs Betina Beakley) and Ben Schwartz (Dewey Duck), with David Tennant (Scrooge McDuck) even sending along a video message to the D23 crowd. The sneak peeks gives us a new glimpse at Scrooge McDuck, who has no trouble with his nephews playing a game of war in the mansion, although we do see that his brother Donald Duck has in fact crossed a very serious line. After the panel presentation, the footage arrived on Disney XD YouTube, which begins with Scrooge McDuck waking up to start a new day. He's greeted by his maid Betina Beakley, who is quite distraught with Scrooge's nephews, making it clear she isn't a fan of their playful warfare games, as Beakley has to save a vase being broken after it's hit by some of their errant Nerf darts. The nephews are also in for quite the surprise when they come across Webby Vanderquack, who is taking the game far too seriously. The clip ends with Scrooge telling Beakley that everyone has to make sacrifices, until he finds Donald Duck in his bathtub, which naturally infuriates Scrooge. You can see in the clip that the boys Huey, Dewey and Louie are all more distinct than the original series, which was done on purpose. Here's what Francisco Angones had to say about this new family dynamic in a statement. "The core of our version of the show is this relatable family dynamic. It's part of why we distinguished Huey, Dewey and Louie a little bit further then they had been before; why we incorporated Webby as part of the kids. We never say it's 'the boys' or 'the nephews' as a group because today family means different things to different people. It's not always a mom and a dad, a couple kids ... What is it like to be a triplet? What is it like to be the friend who's so close that she might as well be family?" The producers also revealed that Huey is the leader of the group, with an A-type personality, while, Dewey represents the reckless middle child, and Louie is more laid-back with a snarky attitude. Angones also described Donald Duck as a single father who they call the "Louis C.K. of Duckburg". 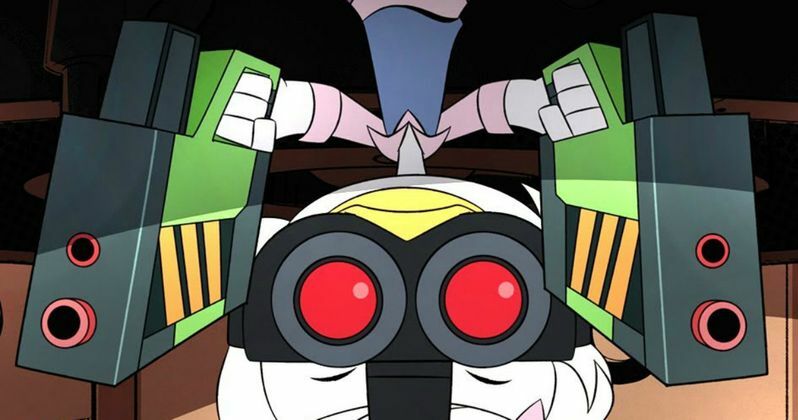 Unfortunately, this sneak peek doesn't feature our first look at Gizmoduck, who will be voiced by Hamilton star/creator Lin-Manuel Miranda, but Angones revealed at the panel that he was surprised to learn that Lin-Manuel Miranda is a huge DuckTales fan, who can apparently sing the Moon Theme to DuckTales at will. We reported last month that the new animated series will premiere with a one-hour DuckTales TV movie, which will be presented for 24 consecutive hours on Disney XD Saturday, August 12, starting at midnight. The series will then debut with two new episodes on two new episodes Saturday, September 23, airing at 7:00 AM, 11:00 AM, 2:00 PM, 5:00 PM, 8:00 PM and 10:30 PM. The episodes will also be available on the Disney XD app and Disney XD VOD on these same dates. Disney XD has already issued a renewal for DuckTales Season 2. The story unfolds as Donald Duck reluctantly takes Huey, Dewey and Louie to the home of their reclusive great-uncle Scrooge McDuck. Enthralled by their once-legendary great-uncle and the wonder of McDuck Manor, the triplets and Webby learn of long-kept family secrets and unleash totems from Scrooge's epic past, sending the family on an adventure of a lifetime to the Lost City of Atlantis. The voice cast also includes Danny Pudi as Huey, Bobby Moynihan as Louie and Tony Anselmo as Donald Duck. Recurring guest voices include Lin-Manuel Miranda as Duckburg's favorite hero Gizmoduck (his alias is Fenton Crackshell-Cabrera), Allison Janney as Scrooge's old flame Goldie O'Gilt, Margo Martindale as the ruthless villain Ma Beagle, Paul F. Tompkins as lucky duck Gladstone Gander, Kimiko Glenn as well-traveled teen Lena, Jim Rash as mad scientist Gyro Gearloose, Josh Brener as tech billionaire Mark Beaks, Keith Ferguson as Scrooge's archenemy Flintheart Glomgold, Eric Bauza as Beagle Boys and Corey Burton as scientist Ludwig Von Drake. Take a look at this sneak peek from DuckTales below.